This crisp retro style is a tribute to the debut of men's cool. An easy care camp shirt featuring peached twill for softness. 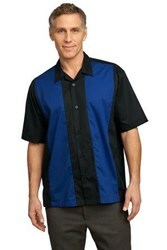 Due to the time it takes to produce the Port Authority Retro Camp Shirt Black/Blue ball it will ship in 1-2 weeks. We cannot ship this ball outside the United States.